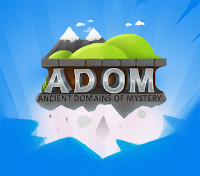 The Official Blog for ADOM (Ancient Domains Of Mystery): A call to arms: Videos wanted! A call to arms: Videos wanted! Whether you regularly perish in the attempts of saving a cute puppy, accidentally bump into shop keepers in a menacing way, get eaten by kobolds or challenge Andor Drakon himself in all your glory, we want the world to see your exploits. Record your playthroughs for us! Ancardia has a dire need for Youtube heroes showing the world the glory of ADOM, because to be honest, there's not much out there yet, and we think it's a shame. We're looking for true heroes and fallen ones, devious tricksters and brave knights. Record some of your playing and share it with the world. Half an hour to an hour of playtime, if your character survives that long, of course. Show us anything! From creating a new character from scratch and braving your first few encounters, clearing out the bug temple, raiding the thieves' guild, destroying Terinyo in the name of Chaos or robbing a Casino, all is fair game. Feel free to explain what you're doing, but this is not mandatory. Both ASCII and Tilemode are perfectly acceptable. 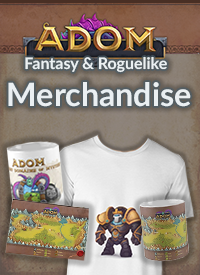 If you submit your uploaded playthrough (Youtube, Vimeo or whatever other platform you can think of) with a link to marketing@adom.de before the first day of June, you'll even be eligible to win something really amazing to put on your wall or dazzle your friends with. We'll be having a look at all the submissions and pick the best three videos. 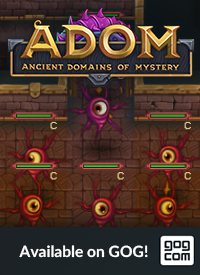 When submitting your links, please let us know if you're happy with us using your material for trailers and other promotions of ADOM. When: Before the 1st of June 2018, whatever timezone you are. Why: Fame, glory, our eternal gratitude and the chance to win something really cool and unique. Guess I know what I'll be streaming/uploading to youtube for the foreseeable future. Im guess there is no rules, and its more movie like? can we use videoredactors? or raw gameplay? Hey Thomas, I would love to try and get in on this video. Only problem is, I have been waiting to start a new character for adom 3.2!!! I cant wait to use customized tiles for my character, pleaaaase release for us, we are desperate for 3.2!! I want to make epic video with customized equipment tiles! Excited for 3.2, and best wishes. We don't care for the version. And the biggest criteria is: Make it interesting and fun to watch - so it's at least somewhat subjective (like any of these contests). 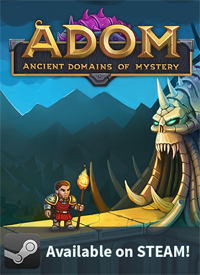 Oh man, at first I was happy that any version of ADOM is acceptable, but fun-wise I don't think I've done anything extraordinary compared to the more hardened ADOM adventurers out there XD Regardless, do you want to see my video? ADOM 3.2.0 released as a Steam beta!